If you don’t have an electronic tuner or you want your banjo to be in tune with others in a jam session, you can use pitches from other instruments to get your banjo where it needs to be. In general, ask another musician to play a certain note on her instrument. Then, try to get your string to match that pitch by turning the tuning pegs. After tuning each open string to the corresponding note, you can then double-check your tuning by using relative tuning techniques. 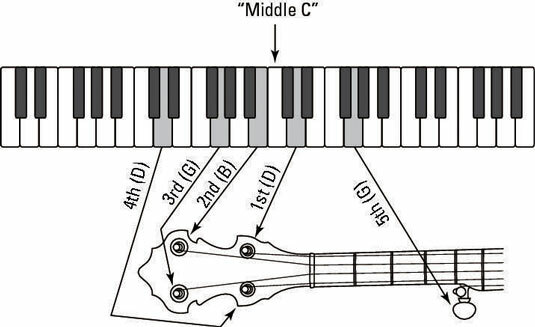 Guitar or dobro: The 4th (D), 3rd (G), and 2nd (B) strings of the guitar are tuned to the same pitches as the corresponding strings in G tuning on the banjo (see the section on G tuning earlier in this chapter for more info). The dobro’s top four strings are tuned to the same pitches as the top four strings on your banjo, so if someone in your jam session is playing one of these instruments, ask to use his pitches as reference points for you to tune your banjo — as long as that person is also in tune, that is! Usually you try to tune your 3rd-string G first, and then move down in pitch to tune the 4th string and up to tune the 2nd, 1st, and 5th strings. When you have a break in between songs, you can ask the guitar or dobro player to play a 3rd string open, or the fretted equivalent if she has a capo on, so you can make sure your banjo is in tune with the other instruments. If you’re out of tune, make adjustments on each string until your strings’ pitches match the pitches on the guitar or dobro. Piano: If you have a piano or an electronic keyboard around the house, that’s another great source for getting reference notes to tune your banjo. Tune each banjo string to the corresponding piano note (see the figure). Fiddle or mandolin: If you’re playing music with just a fiddler or a mandolin player, you can still get in tune with her by asking for her G note. A fiddle is tuned to the same pitches as a mandolin. The open G note on these instruments is the same as your 5th-string G pitch but is an octave higher in pitch than your 3rd-string G.
Piano notes and their corresponding strings on the banjo. The tone of the other instrumentalist’s notes is going to be different than the notes on the banjo, but remember that you’re comparing the pitch of each note, not the tone. When in doubt about your own tuning, don’t hesitate to ask another musician for help.